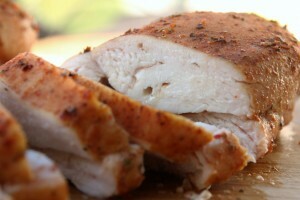 Last week we prepared a delicious last minute smoked chicken breast. However the chicken was hard to resist after it was smoked we did make it with the intent to use it in a salad. The title says “Smoked Chicken Salad with figs”. Since the figs play a key role in this salad they had to hit the grid too. For a while I have been playing with the idea to post a fig sidedish recipe inspired by a recipe my mother told me about. Somehow I always lack an ingredient. Since the recipe only contains four ingredients, you could call it a shame… Then again it’s mostly the figs that are lacking because we ate them before I had the chance to put them on the BBQ. You can’t call it a bad situation I guess. The salad features some star ingredients. You can’t go wrong with smoked ingredients in a salad I think. The chicken breast takes care of this part and adds the subtle flavor you need in here. By slowly grilling the figs you enhance their sweet taste. The ones for my salad were slightly sprinkled with balsamico vinegar in order to bring balance in the palate. All those flavors are needed to counter the bitter taste of the radicchio. To my personal taste only using radicchio makes the result a little bit to bitter. If you like it this way don’t change a thing to the recipe at the bottom. If you like it to be a little bit more subtle you can opt to use fifty fifty Radicchio and Rucola. This smoked chicken salad with figs recipe is easy to make. I recommend smoking your own chicken breasts. However you could buy them it's more fun to prepare them yourself and you have more control of the flavors you want. In case you might need some inspiration for the smoking part, you might be interested in the last minute smoked chicken breasts I made last week (link in ingredients). 2. 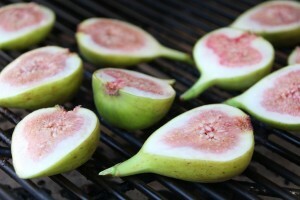 At the end of the smoking process (+/15 minutes before the end) you add halved figs to the BBQ. Sprinkle them with balsamic vinegar. The slow cooking process will enhance their sweetness. Attention: make sure the BBQ isn't smoking to much. I add just enough wood in order to add the smoke flavor in the first part of the preparation so I could safely add the figs at the end. 3. While smoking and preparing the figs you clean the radicchio and rip it apart. Slice the onion thinly. 4. Slice the chicken and mix all ingredients being: Radicchio, balsamic vinegar, smoked chicken, figs, basil leaves, cranberries, raisins and top with the figs. 5. Have a nice meal. I hope you had a nice meal! 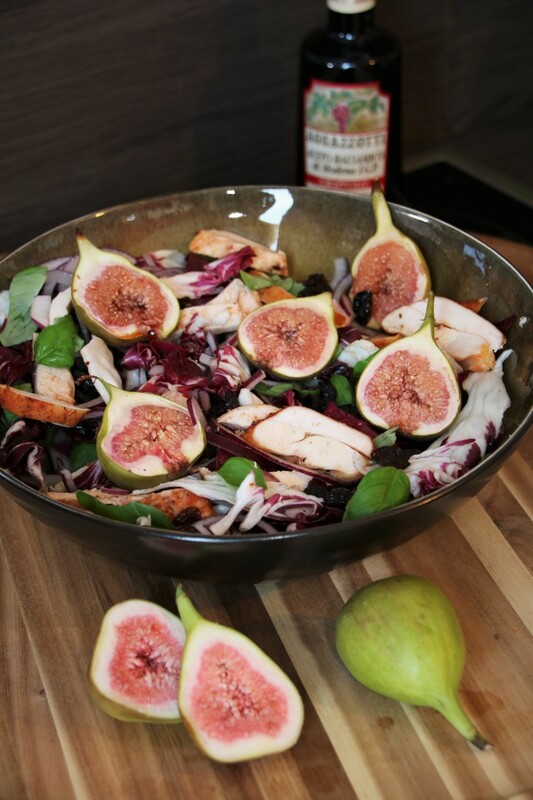 I’m convinced this smoked chicken salad with figs will be a surprise for many of your guests. Please leave a message to share your experience. Please help me spread the word by sharing this recipe. This recipe was based on the recipe I found in the book: "Het sportkookboek". I tried to give it my personal twist. Maybe you want to change some things? I'd like to hear what you've changed and how it worked out.